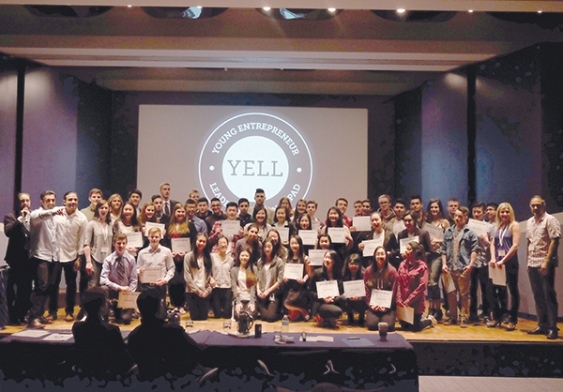 YELL stands for Young Entrepreneur Leadership Launchpad and currently is available in three districts in the Lower Mainland. For the fall, the Sea to Sky District will be blending YELL with the Grade 12 entrepreneurship class. Amit Sandhu, who co-founded the program, said it started in the West Vancouver school district in 2013, and even then attracted 75 applicants for the 30 spots available. Currently, it also operates in Richmond and the Coquitlam Tri-Cities area and will start in Squamish this fall. In the least, the program aims to instill entrepreneurial approaches in students, which they can use in any endeavour, although the hope is that some study business or become entrepreneurs, and beyond this, good community members. Like the other YELL programs, it will be offered to 30 students at Howe Sound Secondary, although there are opportunities for students from Whistler and Pemberton to take part by commuting or video conferencing. Over the course of the year, they will go through three distinct phases for the program. In the fall, they will be introduced to basic entrepreneurial principles, in addition to having access to entrepreneurs from different backgrounds. This “business accelerator” part of the program will start with a panel discussion and move into weekly sessions with visiting entrepreneurs. In the second phase, the students break into teams to work on a project with a mentor. It is referred to as the “idea incubator” period. Finally, the students will aim to compete at the annual “venture challenge” competition, held in the spring. In terms of its potential, Sandhu hopes the venture challenge event will become the equivalent for aspiring entrepreneurs of provincial sports tournaments for high school athletes. Key to the program will be support from area business operators. Locally, Karen Elliott and Sean Lumb will be acting as liaisons with the business community. They were also key in starting the process to bring YELL here after they met with Sandhu and school district officials last summer to discuss the proposal. “Sean and I just wanted to plant this seed,” said Elliott, who operates Elliott Consulting and Coaching and is also a District Squamish councillor. e@UBC program, said Sandhu and his partners are naturals at providing leadership to young people considering business. “Amit and his cofounders are accomplished entrepreneurs and feel strongly about entrepreneurship,” he said.